Her articles are published in the Ming Pao newspaper and the online news site House News as well as her own blog, Catcher in the Rye. Travelling is more than a hobby for Chan, it is a compulsion. She needs to travel, not just as a job, but also for herself. “I feel like I’m being bitten by ants when I stay in Hong Kong for more than half a year,” she jokes. Chan’s first taste of solo travel was a month-long trip she made to Xinjiang at the age of 17, inspired by a cover story in Time magazine. It was an impulsive journey that she undertook, buying her plane ticket a mere three days before departure. In the more than 10 years since then, Chan has made numerous trips to many different destinations, many of them in the Middle East. But it was not always apparent that she would make a career out of travel. Chan had wanted to be a journalist ever since she was in Form Four of secondary school. But her father was set against this choice, warning her about the hardships journalists faced. Due to family pressure, she eventually opted to study government and public administration at the Chinese University of Hong Kong, a subject she was also interested in. From there, she went on to study law at the University of London. Chan did not follow her dreams after graduation. Most of her friends advised her to work for investment banks or accounting firms. Given her good academic results, she was persuaded these would be appropriate career choices. For five years, Chan worked in finance, for investment banks, fund houses and law firms. The work was stable and well-paid but she never enjoyed it. “You find that you understand those investment tools. You have understanding but not feelings towards them,” says Chan. Chan would work for a year in order to save money for travelling. She would then quit the job to experience life abroad and then find another similar job when she got back. This had been her lifestyle until the summer of 2012, when she returned from a half-year trip through the Balkans to Slovenia. This time, she abruptly resigned from her job in a fund house after just three days. “When you have reached a critical point, everything you see [at work] is hateful. I asked myself, is it crazy to quit a job you have only worked at for three days? But I couldn’t hold on,” she says. “It was only then that I realised you can’t leave the thing you want for too long,” she says. 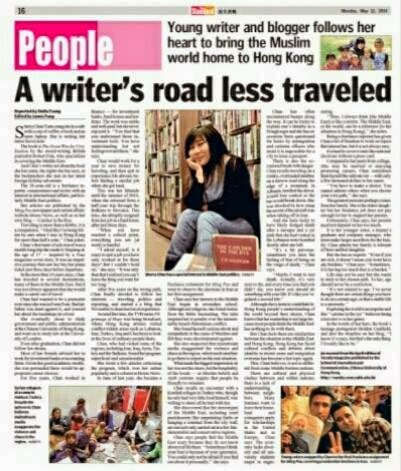 Having spent five years on “the wrong path”, Chan finally decided to follow her own interest: travelling, politics and reporting. In November, she started a blog to share her travelling experience. At around this time, the TVB series Pilgrimage of Hope was being broadcast. In the programmes, Hong Kong artistes visited conflict ridden regions such as Lebanon, Iran, Turkey, Iraq and Chechnya to look at the lives of ordinary people living there. Chan says her interest in the Middle East began in secondary school. Although not religious, she found Bible stories fascinating. The tales inspired her to ponder over the long-lasting Israeli-Palestinian conflict. For reasons she finds “bizarre” she found herself curious and sympathetic to Muslims and felt they were discriminated against. She also suspected the mainstream media had exggerated the violence and chaos in the region. This motivated her to go and experience and report on the real situation in the Middle East. She was surprised to find that what made the biggest impression on her was not the chaos, but the hospitality of the local people. Muslim beliefs and Arab customs require that people be friendly to outsiders. Chan recalls an encounter with a Kurdish refugee in Turkey who, though he only had little food himself, was willing to share all he had with her. She discovered the stereotypes of the Middle East, such as cruel punishments like chopping somebody’s hand off or hanging a criminal from the city wall, are rare acts only carried out in a few fundamentalist and conservative places. She says she also found that Syrians do not welcome U.S. humanitarian intervention. Chan says people find the Middle East scary because they do not know about real life there. “Sometimes I think your fear is because of your ignorance. You could only not be afraid if you find out about it personally,” she says. During her travels to find out, she has encountered bumps along the way. Off the beaten track, it can be tricky to explain her identity as a Hong Konger. Holding a Hong Kong passport, she has on occasion been questioned for hours by local immigration and customs officers who insist it is impossible for a city to issue a passport which can only be issued by a country. She has also had brushes with danger. Chan recalls she travelled on a creaking, seriously overloaded minibus on a narrow road along the edge of a mountain in Albania. She was terrified the driver would lose control of the minibus or that it would break down, but all the other passengers were completely calm; she was shocked by how steep the ascent of the aircraft was when taking off in Iran. And she feels lucky to have dodged possible death after a mosque and a car park that she had visited in the Lebanon were bombed shortly after she left. Although she is keen to contribute to Hong Kong people’s understanding of the world beyond their shores, Chan knows that her readership is not large because most people think the Middle East has nothing to do with them. For her part, Chan feels there are similarities between the situation in the Middle East and Hong Kong. Hong Kong has faced cultural conflicts and debates about identity in recent years and emigration overseas has become a hot topic again. This, Chan believes, is not so different to some countries in the Middle East. There are cultural and physical clashes between countries and within them; there is a lack of understanding between neighbours. According to Chan, many Iranians want to leave their homeland and young Iranians apply for scholarships in the U.S. and in Europe. The economy lacks diversity and all the university students major in engineering. “Thus, I always think it [the Middle East] is like a mirror. The Middle East, or the world, can be a reference [to the situation in Hong Kong],” says Chan. Being a freelance reporter has given Chan a lot of freedom to work on topics that interest her, but it is not always easy. It is hard to cover events like national elections without a press card. Compared to her peers from college, who may be married or enjoying promising careers, she sometimes finds herself the odd one out with only a few thousand dollars to her name. “You have to make a choice…you cannot admire others when you choose your own path,” says Chan. The greatest pressure perhaps comes from her family. She is the eldest daughter but the pay from her freelance job is not enough for her to support her parents. Fortunately, Chan says, her parents need not depend too much on her — it is her younger sister, a master’s graduate and a manager of a company, who has to make larger sacrifices for the family. Chan admits her family is tolerant of their “unfilial daughter”. Life may not be easy but Chan wants to stick to her path. To her, age should never be a restriction, “It’s not related to age. I’ve never thought there are certain things you have to do at a certain age, or that a stable life is a necessity,” says Chan.